As a logical consequence of the huge market success of Vacono products in the Americas, Vacono America LLC was established in 2011 to even better serve American customers with real time support. Also, Vacono America is proud to offer German Engineering combined with US manufactured material, thus benefitting of competitive US material cost as well as market leading engineering. The operations have been established in Cleveland, Ohio, USA. 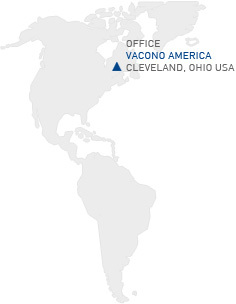 This location is known for its advanced manufacturing and provides Vacono America a central location with ease of access.